Forestry-oriented facilities (honor camps (pdf)) using inmates as laborers were authorized in 1943 (pdf) by the Washington State Legislature. In 1955, the Department of Natural Resources (DNR) began using honor camp inmates at Yacolt to reforest and build roads in the Yacolt Burn. A year later, in 1956, the first honor camp on the Olympic Peninsula was developed near Clallam Bay. The buildings were made of wood and mounted on skids. One of these buildings is still being used at Olympic Corrections Center. The Clallam Bay Honor Camp was relocated in 1968 and became the Clearwater Corrections Center. In June of 1969, Gov. Dan Evans officially dedicated the camp. The facility is located in the middle of a 120,000 acre block of DNR trust land, 27 miles southeast of Forks. The camp was closed in 1973 because of the economy. It reopened in September 1976 and closed again in January 1986. 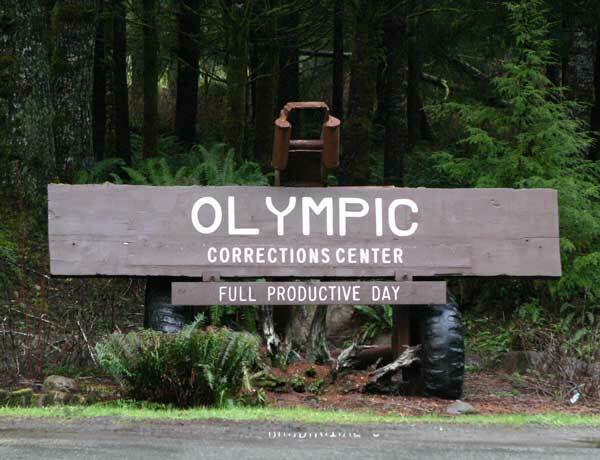 In January 1981, Olympic Corrections Center was opened with a designed capacity of 108 inmates. Clearwater and Olympic Corrections Centers were two separate facilities with one administration. The majority of inmates of both facilities were assigned to perform forest management work and fire fighting for the Department of Natural Resources. When Clearwater Corrections Center was closed in January of 1986, some staff and inmates were transferred to the newly-opened Clallam Bay Corrections Center. The remaining staff and inmates moved to Olympic Corrections Center, increasing the population to 138. In July 1987, Clearwater Corrections Center reopened, housing approximately 100 inmates who were primarily assigned to forestry crews of the Department of Natural Resources. In July 1991, Clearwater and Olympic Corrections Center became one facility with the addition of another unit, the Hoh unit. At this time, the facility became Olympic Corrections Center. Population capacity for Olympic Corrections Center became 350, with 170 designated to be assigned for forestry crews of the Department of Natural Resources. In addition to the forestry crews, OCC also provides four crews for community service projects. They are supervised by correctional officers who take them out of the facility to perform a variety of jobs in the community such as Quillayute Valley Park and Recreation District, and non-profit organizations, such as the Forks Museum and the West End Youth League. These items designed and built by the Woods Products Shop, which are crafted with donated tools and materials, are donated to the Quillayute Valley Scholarship Auction, Cherish Our Children and Others.